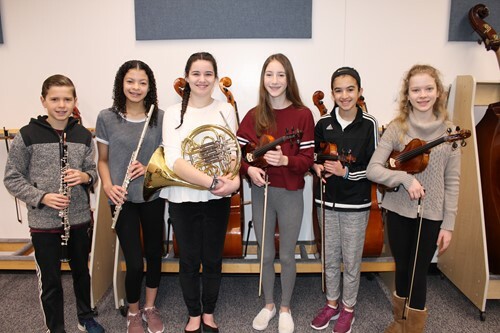 Eight Bethel Park School District musicians were selected to participate in the Pennsylvania Music Educators Association’s Junior High District Orchestra Concert, which will be held on Saturday, March 23 at Upper St. Clair High School. Representing Bethel Park in this event will be Bethel Park High School freshmen Aidan Allridge (bass) and Sarah D’Angelo (violin) as well as Independence Middle School eighth graders Jasmine Cable (flute), Cody Hendrych-Bondra (oboe), Rebekah Tupper (French horn), Samantha Wolf (violin) and seventh graders Clara McGough (violin) and Angelina Velisaris (viola). The string musicians are taught by Bethel Park Orchestra Director Stephanie Glover and the remaining musicians are taught by Independence Middle School Band Director Michael Petrossi.